We’d love your help. Let us know what’s wrong with this preview of HTML, XHTML, and CSS by Elizabeth Castro. To ask other readers questions about HTML, XHTML, and CSS, please sign up. A little over a year ago, my job situation changed slightly as I moved from one capacity into that of the local website manager for our company. I wasn't in charge of any actual coding, just putting the Wordpress CMS to work and helping to build images and content for the site. I decided at some point that using Wordpress wasn't going to be good enough; I wanted to know how the gears worked. Under recommendation from a friend, I picked up a copy of "PHP 6 and MYSQL 5" by Larry Ulman and dug in. A little over a year ago, my job situation changed slightly as I moved from one capacity into that of the local website manager for our company. I wasn't in charge of any actual coding, just putting the Wordpress CMS to work and helping to build images and content for the site. I decided at some point that using Wordpress wasn't going to be good enough; I wanted to know how the gears worked. Under recommendation from a friend, I picked up a copy of "PHP 6 and MYSQL 5" by Larry Ulman and dug in. 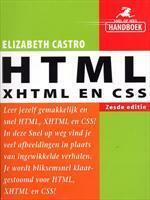 Then I realized I was going to need some HTML/CSS first, so I grabbed "HTML, XHTML, and CSS" by Elisabeth Castro. And dove into that one instead. As a relative newbie to web development via code, I thought the book did a great job of walking me through the basic concepts and giving me the syntax needed to make everything work. 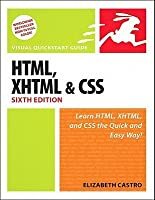 It explains the differences betweeen plain HTML and XHTML, the reasons for using the latter, and a good intro to CSS and it's benefits over the older forms of style markup. The problem I had with the book may just be chalked up to my learning style. While she printed plenty of examples and allowed you to download those examples from her site, that didn't really help me. I could have typed out every example, but then I'd be left with a jumble of random pages. In comparison, as I'm starting "PHP 6..." I've found the examples to be more instructional; they provide a good walkthrough and well labeled files that you build upon as you go through the book. I guess I would've rather the book walked me through building a basic site, so that when I reached the end, I had a large completed project I could look at and be proud, while having learned something at the same time. این کتابو خیلی وقت پیش خوندم؛ زمانی که دبیرستان بودم. یادمه خیلی هم بهش علاقه داشتم. کتاب بسیار روون و خوبیه و تصویری بودنش یادگیری رو خیلی شیرین میکنه. سی اس اس رو هم همراه با آموزش کدهای مربوط اچ تی ام ال توضیح داده. در بین توضیحات، تفاوت اجرای کدها بر روی مرورگرهای مختلف رو هم بیان کرده؛ مثل نت اسکیپ، اپرا و آی ای. البته فکر میکنم الآن این تفاوت ها خیلی مهم نیست. متن اصلی کتاب رو ندیدم تا با ترجمه مقابسه کنم، کتاب رو هم همونطور که گفتم حدود 10 سال پیش خوندم و جزئیات متن رو یادم نمیاد، اما به نظ این کتابو خیلی وقت پیش خوندم؛ زمانی که دبیرستان بودم. یادمه خیلی هم بهش علاقه داشتم. متن اصلی کتاب رو ندیدم تا با ترجمه مقابسه کنم، کتاب رو هم همونطور که گفتم حدود 10 سال پیش خوندم و جزئیات متن رو یادم نمیاد، اما به نظرم ترجمۀ خوبیه چون اچ تی ام ال رو با این کتاب به خوبی یاد گرفتم. This is a very good reference source as are most books from Peachpit Press. 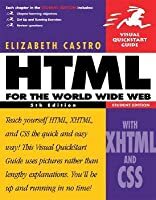 I have relied on Elizabeth Castro's "HTML for the World Wide Web" for many years to create web pages. Elizabeth Castro's writing is very good. Not as good as Laura Lemay (from whose "Teach Yourself HTML 3.2 in a Week" I first learned web programming in 1998). While waiting, several hours, for a friend to get off work, I ventured into a bookstore and picked up Lemay's book and could not put it down. After the first chapte This is a very good reference source as are most books from Peachpit Press. I have relied on Elizabeth Castro's "HTML for the World Wide Web" for many years to create web pages. Elizabeth Castro's writing is very good. Not as good as Laura Lemay (from whose "Teach Yourself HTML 3.2 in a Week" I first learned web programming in 1998). While waiting, several hours, for a friend to get off work, I ventured into a bookstore and picked up Lemay's book and could not put it down. After the first chapter I said, "I can do this!" (I had no programming experience). Years later after maintaining dozens of websites and with the advent of CSS and XHTML it is time to update. Since I bought this book, CSS has moved onto version 4, XHTML is arguably dead, and HTML5 is old news. I’ve moved three times since then, too, and changed jobs a couple times too. Back in 07 when I grabbed this book and swore I’d read it, I did not like CSS one bit. Doing things the long way was fine for me. Old as it is, it was still worth a read-throug Since I bought this book, CSS has moved onto version 4, XHTML is arguably dead, and HTML5 is old news. I’ve moved three times since then, too, and changed jobs a couple times too. I read the 6th edition and it seems that the 6th is very different from the 5th. Overall, I found this a very helpful guide for HTML, XHTML, and CSS. I liked that it incorporated actual code and then a screen shot of what the code would/should look like on your browser. Castro only discusses simple coding, but she makes it easy to segue into the more advanced coding. Interestingly, not all of her code was w3 compliant I think for the purpose of simplicity, but overall, I found this to be a very h I read the 6th edition and it seems that the 6th is very different from the 5th. Overall, I found this a very helpful guide for HTML, XHTML, and CSS. I liked that it incorporated actual code and then a screen shot of what the code would/should look like on your browser. Interestingly, not all of her code was w3 compliant I think for the purpose of simplicity, but overall, I found this to be a very helpful aid. I picked this up to learn the basics of coding a website from scratch. I was technical enough to skip over the basics and just reference what I needed, but I'm a neophyte when it comes to CSS properties, so this book became essential. The diagrams and explanations in this book are well done, a useful guide for beginners and a handy reference when updating a site six months later. The book does have some valuable and relevant information but it is hiding behind a lot of cruft, archaic information and bad code examples from other languages. When I started teaching Web Authoring II at Seattle Central Community College, the previous instructor had setup the class to use this book. I instead switched to CSS Mastery for required reading. I read chapters 1-12 and 15-17, which covered HTML code, laying out a page, CSS stylesheets, forms, tables, and basic editing. Castro explanations of why and how are very easy to understand, with images highlighting the code and showing its effects on the web page for nearly every action. This will be a valuable resource for any future web design ventures. Good resource for getting you started coding in HTML, XHTML and CSS. We used it to teach ourselves enough code to manage our organization's website and HTML mailings and it did the trick. We now keep it to refresh our memories or help us troubleshoot when issues arise. It was a textbook for me so really, how good could it be? While Castro's explanations and directions are clear and easy to follow, some of the techniques are already outdated. The best part of the book is actually her website where you get to see the techniques in action. I've returned to this book over and over again since the semester it was assigned for quick refreshers on how to do something, color choice codes, or how to change something through coding that I can't do the "easy" way. This is a book I will keep for a long time! There's a reason why this book has gone through six editions-- it's a great introduction to HTML for beginners. Supplemented with MacFarland's CSS book, it was a good textbook choice for an introductory class in web design. Definitely keeping this one on the shelf. This book explains things very clearly. It also has a good index, making it an easy to use long-term reference. Not as boring as it looks. HTML is fun! A very good reference book. I'll keep this one on my shelf, if only for the codes at the back for colors, xhtml code, etc. For $5 at the local Value Village, how could I pass it up? It's a technical book that reads like a normal book, so I wasn't bored and I actually learned something. Will wonders never cease? Excellent resource, in addition to w3c (w3.org) and other online resources. An excellent extension of her earlier HTML for the World Wide Web (see my review of that book). A computer book that's understandable. Hurrah! And full of invaluable info too. Might as well add this book--the one I spend the most time with these days, sigh. As a n3rd novice it is quite helpful, illustrative. Right book for everyone who wants to learn basics of web desing. Very well organized with many images showing important steps in html and css. Highly recommended. Studied Spanish, Catalan, and Basque at University of Pennsylvania and University of California at Berkeley. Moved to Barcelona in 1987, found job in computer company translating documentation and software. Started Página Uno in 1990: publisher of Mac related books in Spanish. Moved back to US in 1993 to edit 5th edition of The Macintosh Bible. Wrote first edition of HTML Visual QuickStart Guide i Studied Spanish, Catalan, and Basque at University of Pennsylvania and University of California at Berkeley. Moved to Barcelona in 1987, found job in computer company translating documentation and software. Started Página Uno in 1990: publisher of Mac related books in Spanish. Moved back to US in 1993 to edit 5th edition of The Macintosh Bible. Wrote first edition of HTML Visual QuickStart Guide in 1995, now worldwide bestseller with more than 1 million copies sold in many languages. Also written books on Perl/CGI, XML, Blogger, iPhoto.